No one knows your home better than your curious baby. They always discover and test every corner and cranny. Even reading a lot of books, getting safety tips and taking all the precautions, are not enough to stop them. According to a report by Center for Disease Control, over 16,000 children under the age of 4 years, died from some controllable reasons like drowning, suffocation and other fatal injuries from being struck or falling of the objects. To make sure everything is safe and sound, some parents are taking the help of experts to baby proof their houses. A professional baby proofer can find out the problems that you can’t notice. They can understand the problems and help you reduce the risk of accidents. A professional baby proofer can provide [protection as well as give some practical tips for the prevention. The combination of these two will help to lower the risks in and around the home. They will recommend and properly install the best safety products with their experience to provide the overall safety of the children. 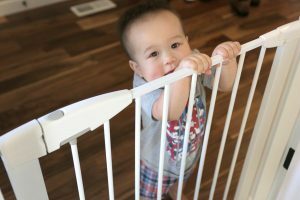 What is the right time for baby proofing? Hazards may change as your child grows from infant to toddler, or from toddler to preschooler. At every stage, the kids experience an exciting time, but also have some hidden hazards. The process of baby proofing starts before your child becomes mobile that is about 6 to 9 months. You want to be proactive, not reactive. By hiring a professional baby-proofer will help you to make your home safer for your child. A professional baby proofer may eliminate the risk of incorrect installation. Baby safety products are more effective when they are installed properly and accurately. For average parents purchasing the right products and installing them properly may take 8 to 12 hours. But the professionals can purchase the right products in less time period as they have enough knowledge of the products. And also take around two hours for their installation. With their experience, they will save your time as well as money. Safety product manufacturers take the views of the professionals for input to help develop and enhance their safety products. That will help to make the safety products safer and help experts to stay up to date on the latest products and can bring awareness to the new or hidden dangers. A professional baby proofer will review each and every corner of your home. They properly baby proof your home from every single room to your kitchen and bathrooms. They properly evaluate your house for the hidden hazards and baby proof them properly to reduce the risk of unintentional hazards. Many of the safety products are not available at retail stores or quite limited. Baby safe Homes provides direct access to the fine quality safety products. As a professional, we always use great quality of safety products that not only give you better quality products but also give you more options which in turn last longer. We are professional baby proofers with all the right tools and equipment and help you make your baby safe for your kid so that you can take a deep breath that your baby is safe in your home.